Ambulances spent nearly 1,200 hours queuing outside the Queen Alexandra Hospital in Portsmouth in one month, city councillors have heard. Portsmouth City Council's health scrutiny panel heard the figure is now down to 300 hours a month. 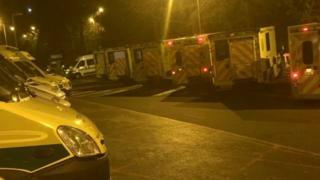 Tracy Redman, head of operations for South Central Ambulance Service, said this was "still too high". A spokeswoman said the increase in lost hours for ambulances could have partly been due to the "winter rush". The 1,200 hours lost in January is nearly double the figure for October, when patients were waiting for up to seven hours in ambulance queues. The scrutiny panel also heard the time taken for ambulances to reach patients hit a peak in March. Ms Redman said more than 100 of the most urgent patients, categorised as "red" calls, waited for more than 30 minutes, the highest total for a year. She said the situation had recently "settled down" and waits were "not as high now". The panel was told problems with queues were "more acute" on Mondays, because fewer hospital patients were discharged at the weekend. A spokeswoman for South Central Ambulance Service said: "We are not seeing as many ambulances queuing outside the Queen Alexandra Hospital now, however we have still got lots of work to do to drive down the delays further. "Around that time of year we do always see a significant increase in pressure on all NHS services between January and March." It is not known how the service is working to cut waiting times, however in February this year a CQC report revealed the hospital had made "sustained improvements".